Note: This post could be considered slightly spoilerly for some Marvel comic story lines involving the Guardians of the Galaxy. If you've been to an action/sci-fi movie at the movie theater lately you have probably seen the trailer for the next Marvel Studios movie, The Guardians of the Galaxy. Unless you are familiar with a deeper cut into Marvel’s cosmic world, you may be asking yourself the question asked in the trailer, “Who are these guys?” Well, like many comic book back stories (and some Facebook relationship statuses), it’s complicated. My aim here is to give you enough to lay groundwork for the movie, and to hopefully pique your interest in reading some of the comic story lines. The Guardians were created back in 1969, I’m not going to focus too much on that team, mostly because I love the 2008 team. But I think it’s interesting to note that this team has been around for a good while (and were NOT just created for a movie). For the purpose of this post I’m going to go over the team member that are in the movie, but like many teams membership changes. The Basics: The Guardians of the Galaxy are a team of aliens and super-powered beings put together by Peter Quill (Star-Lord). He puts this team together after the Phalanx/Kree war, with the goal of protecting the universe proactively rather than just coming together when the worst is happening. Based on the movie trailers the movie origin seems to be a little more “rag-tag outlaws teaming together for a cause bigger than themselves.” And there is a bit of that in the comics, but the war has already given them the motivation to know that a more proactive protective force is needed. That said, forming a team takes time, and shortcuts are taken to push them together more quickly...which never ever back-fires, right? The Guardians establish their home base in a space station called “Knowhere”. From Knowhere, the Guardians can go anywhere they are needed thanks to a teleportation system. Bonus points: Knowhere is the severed head of a Celestial, and the chief of security is a Cosmonaut dog named Cosmo who has telepathic abilities. Comic Origin-Peter Quill is the half human-half alien leader of the Guardians. Born on earth, he was drawn to the stars. After his mother was killed he ran away from the orphanage and began his quest to go into space with NASA. Despite his lack of social skills, Quill eventually gets assigned to a space station. While Quill is on this space station, an alien being visits and offers up the mantle of "Star-Lord" (think space-cop). Quill volunteers but is rejected due to the aforementioned lack of social skills. Rather than accepting this, Quill fights his way to the position, pushing his rival out of the way at the moment of selection. Once he becomes Star-Lord, Quill travels around the galaxy making allies and enemies, like one does. He even does a stint in the Imperial Guard. When the Annihilation wave hits, Star-Lord plays a pretty big role. I want to avoid any major spoilers, so let's just say I think this is the experience that puts him on the path to bring together the Guardians of the Galaxy. 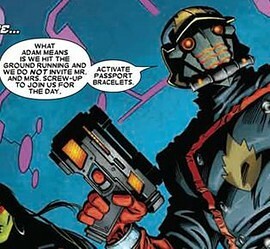 Annihilation: Conquest- This was my intro to Star-Lord and shows what he was up to before assembling the Guardians. Also I have a feeling the Marvel Movies are heading towards an Annihilation story line. 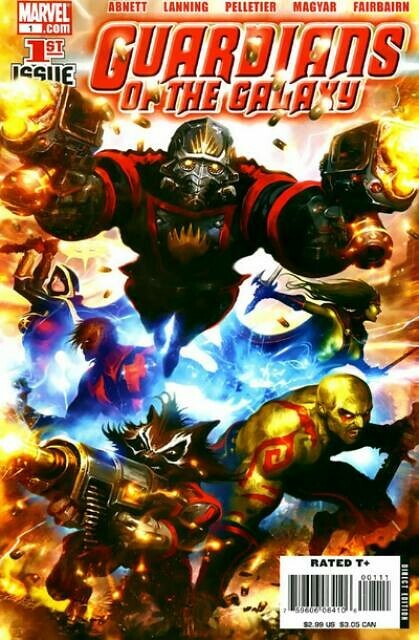 Thanos: Redemption- Star-Lord appears in a few issues here after many many years of character limbo, the things that begin in this book relate directly to the two Annihilation series and beyond. Note- Star-Lord's origin is complicated because it's been ret-conned a few times. Most recently to fit the movie...Peter finds his father's elemental gun, keeps it with him though his childhood of orphanages and foster homes, and then is motivated to go into space "to protect the earth". This feels weaker to me so the origin I laid out is closer to his original. Yeah, that's a pretty big title and you don't exactly get it by being a wallflower. Gamora is the sole survivor of her race. As a child she was found by Thanos (he should probably get an entire post of his own), adopted, and trained by him to be a living weapon. Unfortunately with youth comes curiosity and once, while traveling with Thanos, she left their ship to explore a planet. On that planet she was attacked, and despite her great skill, she was outnumbered and some seriously bad stuff happened to her. Thanos found her and was able to both heal her and upgrade her abilities to include bionic implants and a healing factor (like that guy Wolverine). 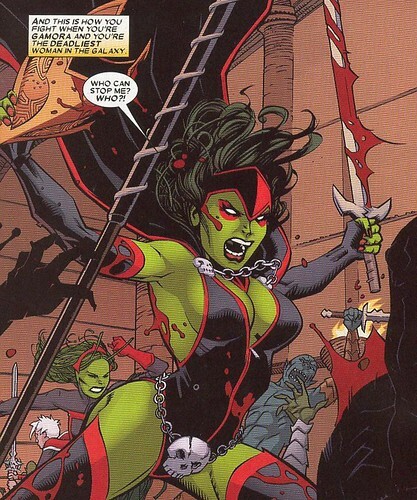 The Annihilation War finds Gamora leading of a fringe colony of lethal super-powered ladies called "The Graces". Also her blade is called "Godslayer" (take that, Joffrey Baratheon). After fighting in the Annihilation war Gamora joins up with the Guardians of Galaxy hoping to find greater purpose for the common good. Annihilation: Conquest- Watch Gamora take on Ronan the Accuser! Meet "The Graces"! Strange Tales 178-181- First Appearance, where she teams up with Adam Warlock and Pip the Troll. Warlock and the Infinity Watch- Gamora is part of the Watch, who keep the Infinity Gems safe. Next Time: Drax the Destroyer, Rocket Raccoon, and he who is Groot! Check it all out in Part 2!